Every once in a while I crave for comfort food, and besan ka paratha is comfort food for me. Not only is it easy to make, it is also very healthy, and given that I am a diabetic it keeps me within my diet restrictions. I usually eat it with mango pickle, some chutney and fresh curds. That makes it a complete meal. Gram flour, also known as garbanzo bean flour, chickpea flour, or besan, is a pulse flour made from ground chickpeas. Used in many countries, it is a staple ingredient in Indian, Pakistani, Nepali and Bangladeshi cuisines. Gram flour can be made from either raw chickpeas or roasted chickpeas. The roasted variety is more flavorful, while the raw variety has a slightly bitter taste. Mix all the ingredients with a Tbsp of oil and knead it into a soft dough. If need be oil your hands and make the dough smooth. Heat an iron griddle or a non stick pan and start rolling out round parathas in round shape of about 6" diameter. 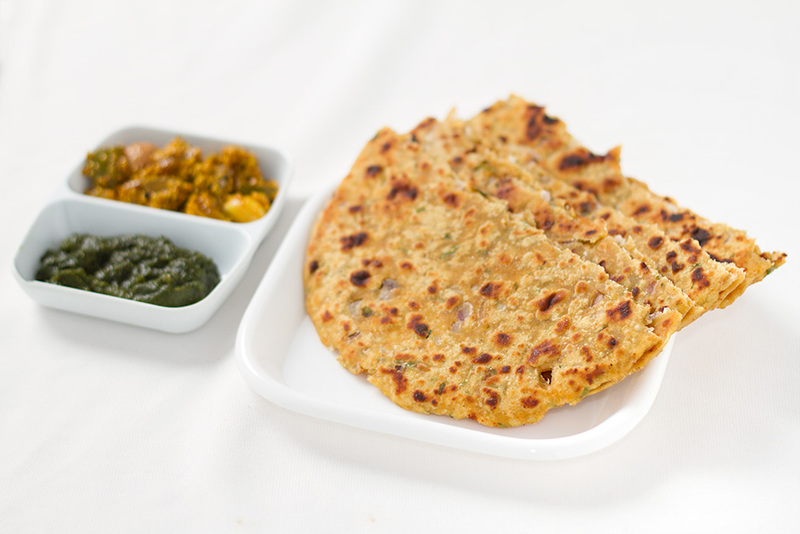 Use some dry wheat flour so that the parathas do not stick to the rolling board and pin. Turn over, brush some more ghee on both the sides and let them cook evenly. Serve these tasty parathas hot with pickle, chutney and curd as a meal, or simply have them with your evening tea as a heavy snack. This is indeed a great recipy. I love it also get this made at home. I am.also.a.diebatic and if you can share some good veg diabatic recipes itnwold be great and also helpful to others also. Hope to get the same soon. Hey swati,can u post more recipes for diabetics.my husband is a diabetic n foodie too. Thanks for the receipe I have been wanting to cook besan based rotisserie for my old mother who is diabetic . I hope to do a good job by trying your receipe. I have always enjoyed cooking, and do not mind trying out new receipes.